A basic crack usually less than 2" in length beginning at the edge of the flange and traveling towards the face (pretty) side of the wheel can usually be straightened and welded.. 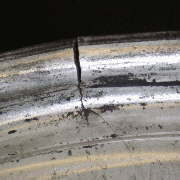 This type crack is mostly found to occur on import (Chinese) wheels. They are caused by the low pressure casting techniques used to make the wheel that allows casting voids or air bubbles to form creating weak points that can crack. This type of crack can occur without necessarily bending the wheel. These are especially common on larger wheels. Domestic and European original wheels are usually not as susceptible to these cracks, but they do happen in these wheels as well. This type of crack can usually be TIG welded by our qualified wheel specialists. This type of crack, running around the inside of the barrel is generally longer and usually accompanied by a flange bend, but it can still usually be repaired. 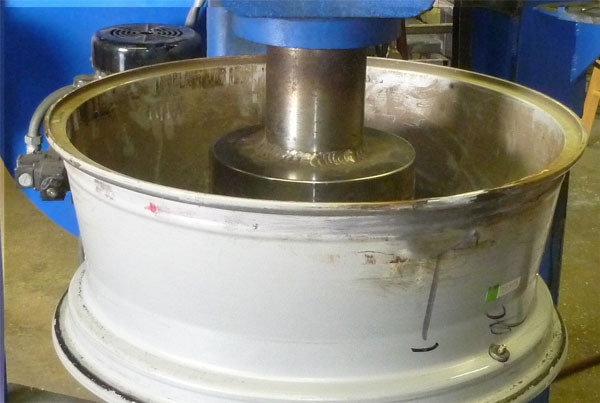 Straightening is first required to return the wheel to its original shape. paying extra attention to insure that the crack comes back together exactly. 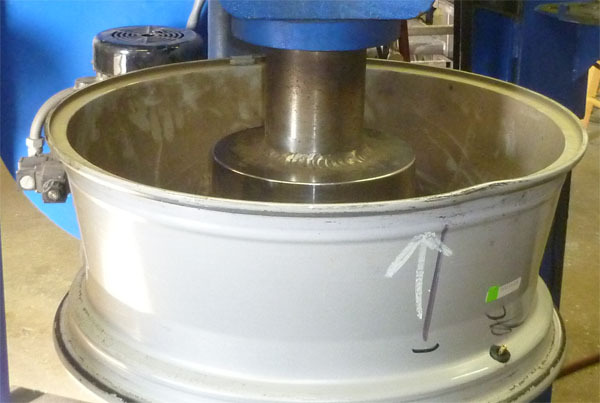 Usually the process of straightening of the wheel can be expected to lengthen the crack beyond the original length when the wheel was in a bent condition. 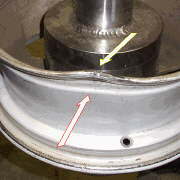 Exact realignment in straightening this type of crack allows our qualified wheel specialists to then TIG weld (Tungsten Inert Gas Welding) the crack to complete the repair..
Our professional technicians use the latest technology to insure that your wheel is returned to factory specs before it is shipped back out to you.. The quality requirements placed on our technicians have resulted in a return rate of less than 1% over numerous thousands of repairs. These standards are designed to conform to the stringent demands of auto repair services and the auto insurance industry. Our usual turn around time for a bent wheel is one business day. Click here for the repair page. ©2017 Hubcap and Wheel All Rights Reserved.